Overview: After working in the shadows of their mentors for years, the teenage sidekicks get together to form their own super-hero club. Robin, Kid Flash, and Aqualad are brought together by chance. 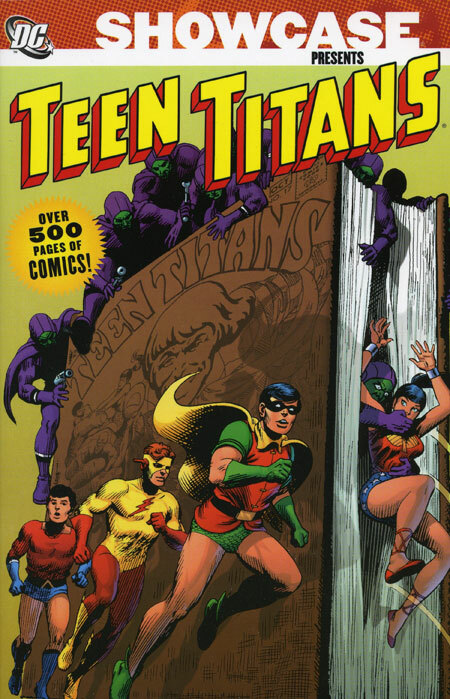 Add in Wonder Girl in the second appearance of the teenage heroes, and a new team is formed, the Teen Titans. Teenage super-heroes have the same issues as any other teenagers of the 1960s. Boys don’t understand girls, and girls don’t understand the boys, and the grown-ups don’t understand the teen-agers. A lot of these stories have similar plots where the Teen Titans are called in to help settle a dispute between the adults and the teens of some unheard town. The generic villain of the month will show up, never to appear again in any DC comic. The strength of this volume is the featured characters in Robin, Aqualad, Kid Flash, and Wonder Girl. These four formed the core of all versions of the Teen Titans to follow for the next fifty years. Why should these stories be Showcased? : I will be the first to admit that I give a pass to any story written by Bob Haney. As seen with his stories in The Brave and the Bold during the Batman team-up era, Bob Haney gave the reader a fun read with each and every issue. Continuity was only observed when it benefited the story. He often broke the fourth wall to address the reader directly. And he would do his best to work in the then-current slang of the time. The Bob Haney Teen Titans were teenagers first and super-heroes second. If you like Bob Haney stories, by all means pick this up. If you are a continuity nit-pick, this volume may not be your cup of tea. Footnotes: The name “Teen Titans” was not introduced until their second appearance, in The Brave and the Bold #60. For their first appearance in The Brave and the Bold #54, it was billed as “Kid Flash, Aqualad and Robin”. Teen Titans #18 was co-written by Marv Wolfman in one of his first published stories for DC Comics. In 1980, he and George Perez recreated the Teen Titans, making it one of the most popular titles of that decade. While Speedy makes a few appearances in this volume, he does not officially join the team until Teen Titans #19, which is collected in Showcase Presents Teen Titans Vol. 2. At the end of the 1970s series, Speedy is retconned into the origin story of the Teen Titans, making him one of the original founders of the team, along with Robin, Aqualad, Kid Flash, and Wonder Girl. If you like this volume, try: the 2003 Teen Titans series, originally launched by Geoff Johns and Mike McKone. This was a fresh take on the Teen Titans concept, using the next generation of teenagers using the code-names of the legacy characters (the Tim Drake Robin, the Conner Kent Superboy, the Bart Allen Impulse/Kid Flash, and the Cassie Sandsmark Wonder Girl). Beast Boy, Cyborg, and Starfire (three of the four new members of the Wolfman-Perez Teen Titans of the 1980s) serve as the adult mentors to this new generation of Titans. There is a lot of fun energy found in the early issues of the series, but it quickly grew up as outside influences, from DC editorial and from the real world, changed the direction of the series. All of Geoff Johns’ Teen Titans stories have been collected into one large, 1,400+ page omnibus, but there are smaller trade paperbacks available as well. This entry was posted in DC Showcase Presents, Teen Titans and tagged Bob Haney, Nick Cardy, Teen Titans. Bookmark the permalink. Pingback: Throwback Thursday – Showcase Presents Teen Titans Vol. 1 | WORST. COMIC. PODCAST. EVER!